Born on 10th March 1901 in one of the most spiritual places of Central Tibet, Tsel Gungtang, His Holiness Kyabje Trijang Rinpoche Lobsang Yeshe Tenzin Gyatso was the third incarnation in the line of Trijang Rinpoches. 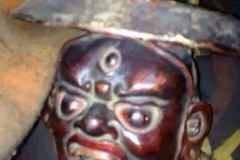 The first was the 69th Gaden Tripa and the second was the 85th Gaden Tripa, the Gaden Tripa being the head of the Gelugpa school of Tibetan Buddhism. 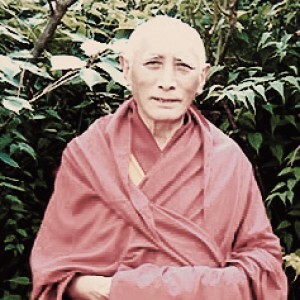 Kyabje Trijang Rinpoche was born to a family with a unique and strong affiliation with Vajrayana Buddhism. 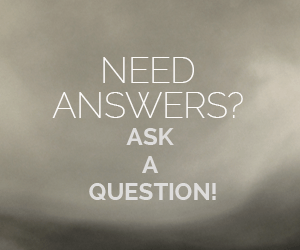 His father, Tsering Dondrub, descended from the uncle of His Holiness the 7th Dalai Lama. His mother, Tsering Dolma, was the third wife of his father. His parents married after the death of Tsering Dondrub’s fifth son who was also Tsering Dolma’s first husband. 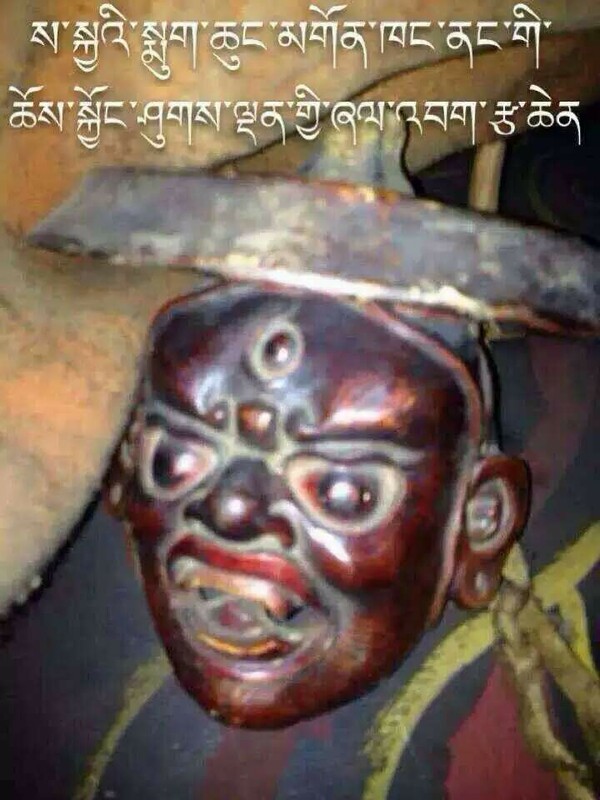 In fact, Tsering Dondrub fathered children with three different women, including Tsering Dolma, and in each case at least one male child was recognised as a tulku, or reincarnated great master. At the time of Kyabje Trijang Rinpoche’s birth, an apricot tree flowered and bore thirty apricots in mid-winter, which was nothing short of a miracle. 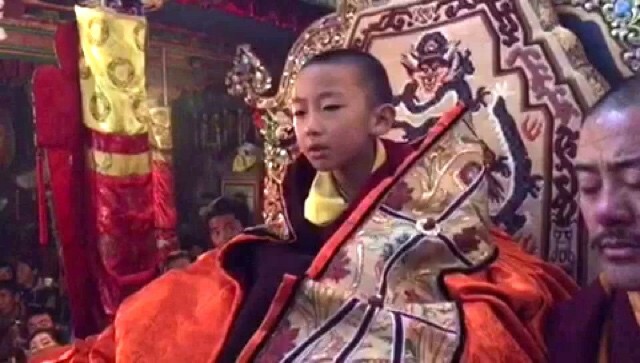 At an early age, Kyabje Trijang Rinpoche displayed the traits of a reincarnated master and was a precocious child who gravitated towards religious paintings, statues, as well as Tantric ritual implements. He was reciting prayers even before he could walk. 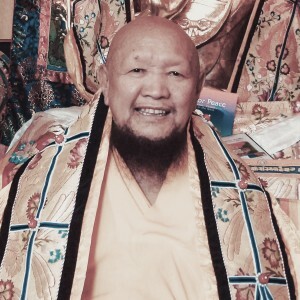 Ngarampa Losang Tendar and Geshe Gendun Dragpa Chen were both tasked with finding the reincarnation of the previous Trijang Rinpoche Losang Tsultrim Palden who, shortly before he passed into clear light, had instructed them to stop at Tsel Gungtang. When they travelled there, it is said that upon seeing them, the young Trijang Rinpoche yelled out, “Gendun Dragpa!” and asked Gendun Dragpa to wash his feet. It is no coincidence that Gendun Dragpa used to wash the feet of Losang Tsultrim Palden when the previous Trijang Rinpoche suffered bouts of rheumatism. It would be best to recognise the boy born to the Gungtang girl Tsering Drolma in the Iron Bull Year as the reincarnation of the former occupant of the Ganden throne. Further, the state oracles of Gadong and Nechung both singled out the young Trijang Rinpoche from amongst the candidates. The young Kyabje Trijang Rinpoche was invited by His Holiness the 13th Dalai Lama to the Lhasa Trijang residence in 1904. Although only three years old at the time, he showed signs of swift learning, easily and quickly absorbing whatever he was taught. Kyabje Trijang Rinpoche’s recognition was initially resisted internally, wherein the head of the regional khangtsen or monastic house of Gaden Jangtse Monastery contemptuously turned him away. He was also resisted externally, as the local Chatrengpas had their own candidate and did not hesitate to threaten the “usurper”. However, they eventually embraced Kyabje Trijang Rinpoche much later around 1929, and vowed to venerate him unconditionally as they had his predecessor. Things were also not smooth on the home front. 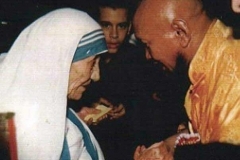 When Kyabje Trijang Rinpoche was five years old, his mother and her two other children were evicted from their family home by relatives who had been left to care for them by his father. His father had decided to renounce all worldly matters and take monastic vows. 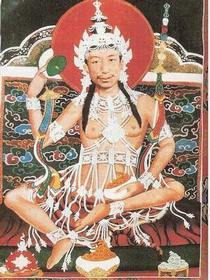 In his autobiography, Kyabje Trijang Rinpoche likened the situation to that which happened to Milarepa’s mother. 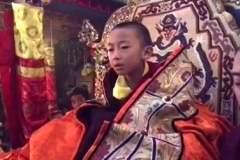 Notwithstanding such early challenges, at the age of five Kyabje Trijang Rinpoche began his education at Chusang Ritroe, the hermitage of his illustrious predecessor Jangchub Choepel. It was at Chusang Ritroe that Kyabje Trijang Rinpoche first met His Holiness Kyabje Pabongka Rinpoche Dechen Nyingpo Jampa Tenzin Trinley Gyatso, who would later become his root guru. It was from Kyabje Pabongka Rinpoche that Kyabje Trijang Rinpoche received his first teaching, “Set of Initiations into Manjushri from the Secret Lineage of Tsongkhapa”. 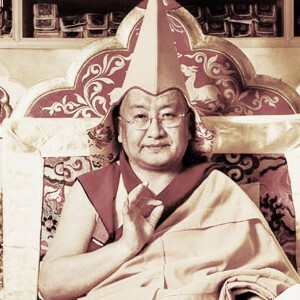 Pabongka Rinpoche took great delight in caring for the young child. After the morning memorisation sessions, the young Trijang Rinpoche loved to join Pabongka Rinpoche, who would put the young boy on his lap, make him wonderful drawings, and perform all sorts of sacred dances for him. 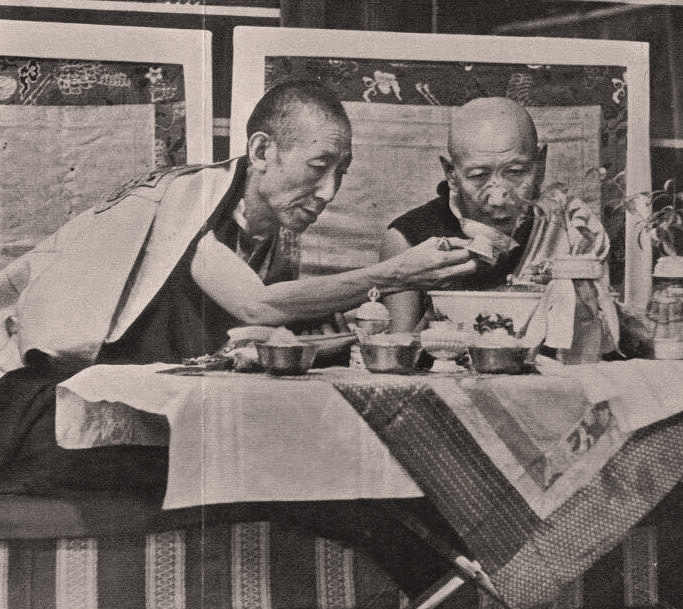 It is also said that when Trijang Rinpoche caught Pabongka Rinpoche at rest, Pabongka Rinpoche would sit the young Trijang Rinpoche next to him and share his food with him. Within the highly hierarchical Tibetan society, this emphasised their equality. 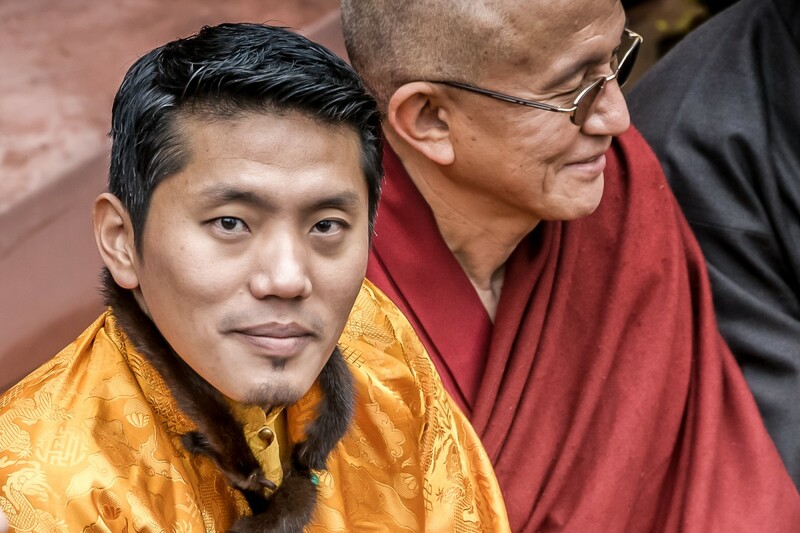 Their strong connection was to last a lifetime and Trijang Rinpoche became Pabongka Rinpoche’s closest disciple. Early in the summer of 1907, Kyabje Trijang Rinpoche’s assistants took him to Gepel Ling at Reting Monastery where he received the five lay Pratimoksha vows and the 10 novice vows of a monk. He also received the name Lobsang Yeshe Tenzin Gyatso from the 4th Reting Rinpoche Jetsun Ngawang Yeshe Tenpai Gyaltsen. 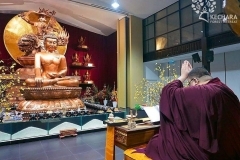 While at Gepel Ling, Kyabje Trijang Rinpoche memorised and analysed the meaning of many Buddhist texts, including over half of Madhyamakavatara by Chandrakirti, within a short period of time. 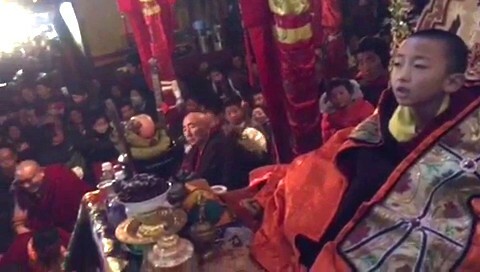 Thereafter, Kyabje Trijang Rinpoche became a part of Dokhang Khangtsen at Gaden Shartse Monastery. 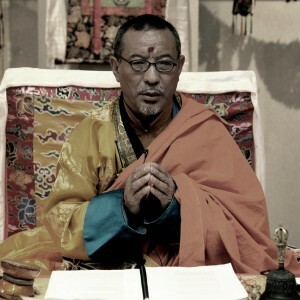 Interestingly, when names were submitted to Kyabje Pabongka Rinpoche and to Dharmapala Dorje Shugden (the traditional Protector deity of Trijang Rinpoche’s lineage), to be assigned as Kyabje Trijang Rinpoche’s instructor on Buddhist philosophical study and debate, both Kyabje Pabongka Rinpoche and Dorje Shugden chose the same person, Geshe Lobsang Tsultrim. It is said that Geshe Lobsang Tsultrim never had to scold his brilliant pupil, as Kyabje Trijang Rinpoche worked hard and was amazingly well-behaved. In 1908, at the age of seven, Kyabje Trijang Rinpoche received the Kalachakra initiation as well as the empowerments of Manjushri, Avalokiteshvara and Vajrapani at Gaden Shartse Monastery from Serkong Dorje Chang Ngawang Tsultrim Donden. 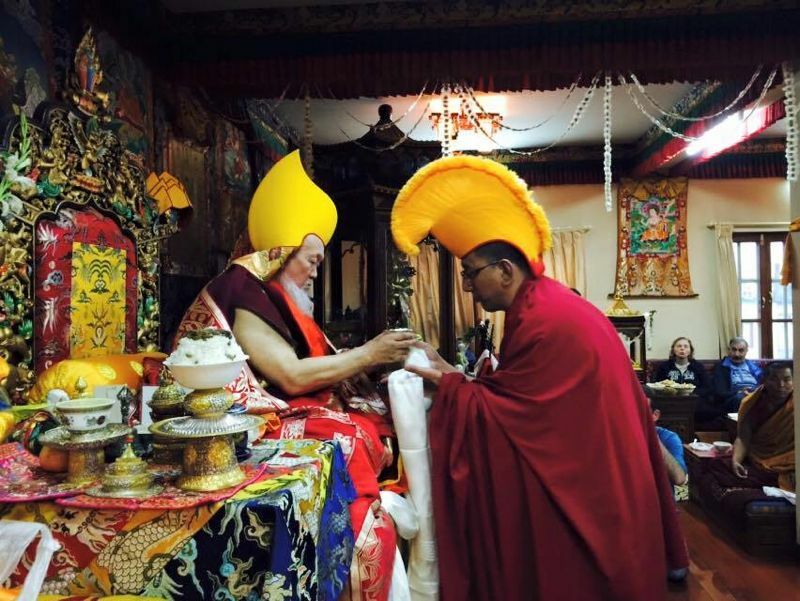 During the ceremony, Serkong Dorje Chang called upon Trijang Rinpoche when he needed a young monk for the vase initiation, after which he presented Trijang Rinpoche with the blessing of the remaining mixture of butter and honey meant to be a “remedy for the vision”. Trijang Rinpoche consumed the gift delightedly, a sign that he would absorb the entire teaching with the same ease and pleasure. 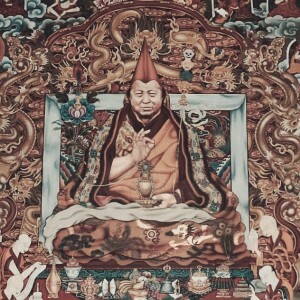 At the age of nine, Kyabje Trijang Rinpoche contracted smallpox but after he completed a long-life retreat, the illness did not seriously affect his health. 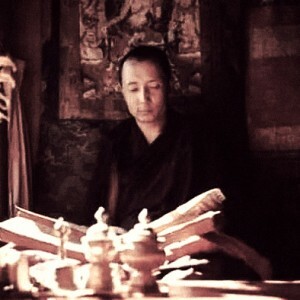 Kyabje Trijang Rinpoche diligently spent the next 12 years in Gaden Shartse Monastery studying the classical texts for the Geshe degree (Pramanavarttika, Madhyamaka, Prajnaparamita, Vinaya and Abhidharmakosa – according to the textbooks written by Panchen Sonam Drakpa) and also the collected works of Lama Tsongkhapa, His Holiness the 1st Dalai Lama and Panchen Lama Chokyi Gyaltsen. He was also known to debate all night outdoors in the bitter cold, even though his hands would chap so badly that they would crack and bleed. It is thus not surprising that he was at the top of his class. 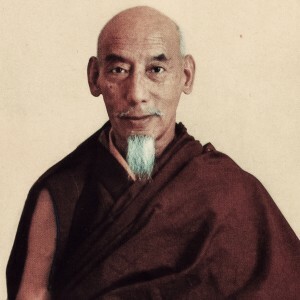 In 1919, Kyabje Trijang Rinpoche received the Geshe Lharampa degree from His Holiness the 13th Dalai Lama when he was only 18, after he debated before geshes from the three major Gelugpa monasteries for his final examination. 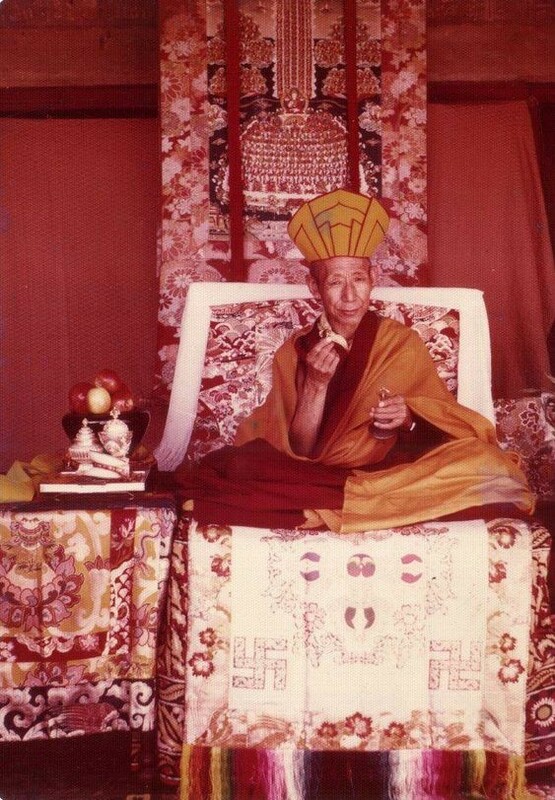 Initially doubtful as to whether Trijang Rinpoche would be intellectually up to the task due to his young age and relatively short period of study, the geshes ended up “praising him to the skies” for the answers he gave. 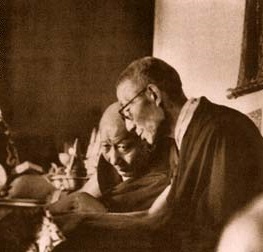 Kyabje Trijang Rinpoche also received his full bhikshu (monastic) ordination from His Holiness the 13th Dalai Lama in 1919 and thereafter, proceeded to enrol in the Upper Tantric College (Gyutö) to engage in detailed study of the Root Tantra of Heruka and its commentary by Lama Tsongkhapa, “Illuminating all Hidden Meanings“. 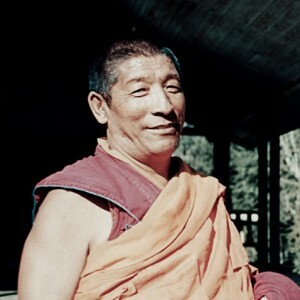 During his time at Gyutö, Kyabje Trijang Rinpoche would often travel to wherever Kyabje Pabongka Rinpoche was teaching to receive instruction. He would also spend his free time meditating on the Lamrim and completing the approximation retreats (las rung) of various deities. Each of these deities were later featured prominently in Kyabje Trijang Rinpoche’s writings. After a year in the Upper Tantric College, Kyabje Trijang Rinpoche went to Chatreng in the Kham province where he received more teachings and engaged in meditative retreats on the deities Yamantaka, Five Deity Heruka, Vajrayogini, Hayagriva and Avalokiteshvara. 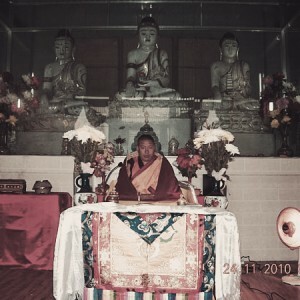 From the ages of 20 to 22, Kyabje Trijang Rinpoche received many teachings and empowerments from Kyabje Pabongka Rinpoche, including the initiation into the sindhura mandala of Vajrayogini according to the tradition of Naropa, the Heruka body mandala empowerment according to Ghantapa’s tradition, teachings on the Lama Chöpa (Offering to the Spiritual Guide), Gelugpa Mahamudra, the Lamrim Chenmo (Great Stages of the Path) by Lama Tsongkhapa and Seven Points of Training the Mind by Geshe Chekhawa. It is undeniable that Kyabje Trijang Rinpoche was Kyabje Pabongka Rinpoche’s closest student, the one to whom he passed all of his lineages, including the teachings and transmissions for the deity Dorje Shugden, who was the main Protector practice emphasised by Kyabje Pabongka Rinpoche. 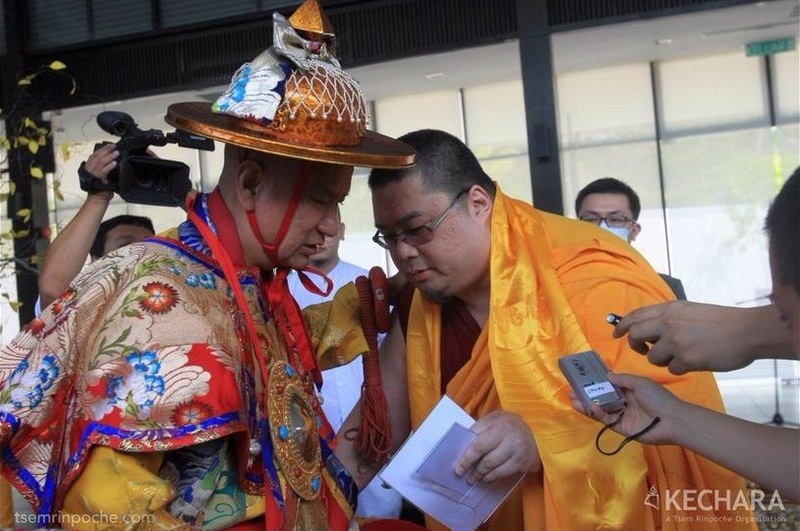 Kyabje Pabongka Rinpoche received the practice of Dorje Shugden from Tagpu Pemavajra, who in turn received the oral transmission of this practice from Dorje Shugden himself. Kyabje Pabongka Rinpoche is known to have promoted the Vajrayogini Tantras and Dorje Shugden’s practice extensively throughout his life. 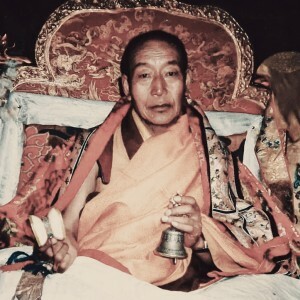 Following his guru’s footsteps, Kyabje Trijang Rinpoche did much to proliferate Dharmapala Dorje Shugden’s practice and bestowed the life-entrustment initiation to innumerable High Lamas, geshes and ordinary monks throughout his lifetime. 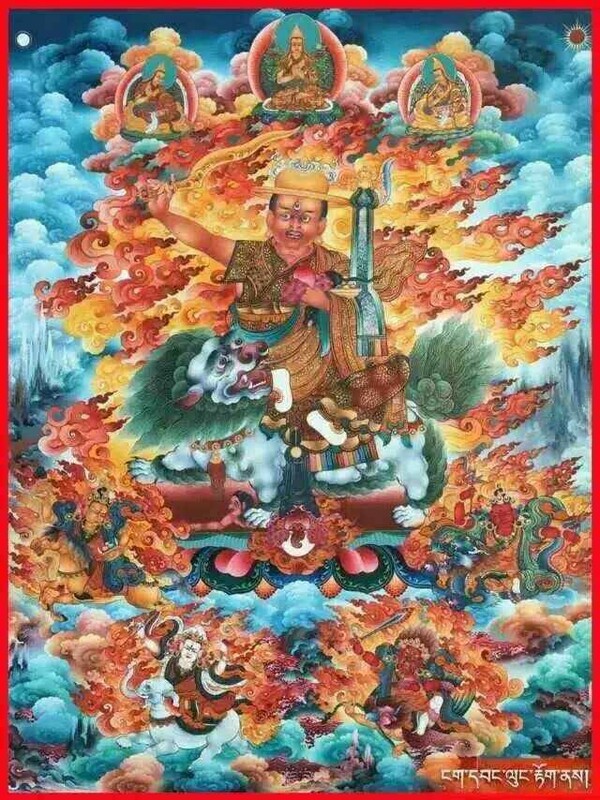 He also wrote extensively on the practice of Dorje Shugden to ensure the preservation and continuity of the practice for future generations. 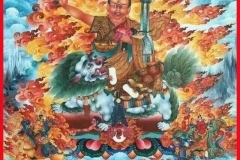 Kyabje Trijang Rinpoche’s Collected Works comprises eight volumes and he deemed it fit to dedicate an entire volume – Volume Five – for literature pertaining to the Protector Dorje Shugden. Titled “Music Delighting the Ocean of Protectors“, Volume Five enumerates the previous lives of Dorje Shugden as well as various other aspects of this Dharma Protector and a comprehensive collection of ritual texts associated with the propitiation of this enlightened Protector deity. In addition, Kyabje Trijang Rinpoche was known for finding and training Dorje Shugden oracles including the current 7th Panglung Kuten. 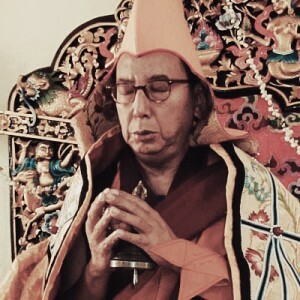 Kyabje Trijang Rinpoche continually deepened his knowledge of Lamrim and Lojong, which are methods for training the mind to develop Bodhicitta. 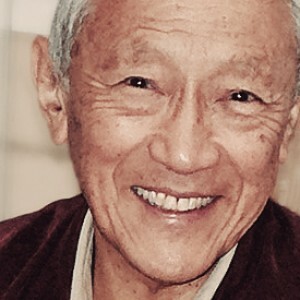 In fact, his most famous work is undoubtedly “Liberation in the Palm of Your Hand” a Lamrim text based on notes taken over 24 days during Kyabje Pabongka Rinpoche’s 1921 Lamrim teachings at Chusang Ritroe, which intertwined the “Swift Path” and “Manjushri’s Own Speech” Lamrim systems with instructions on the “Seven-Point Mind Training”. 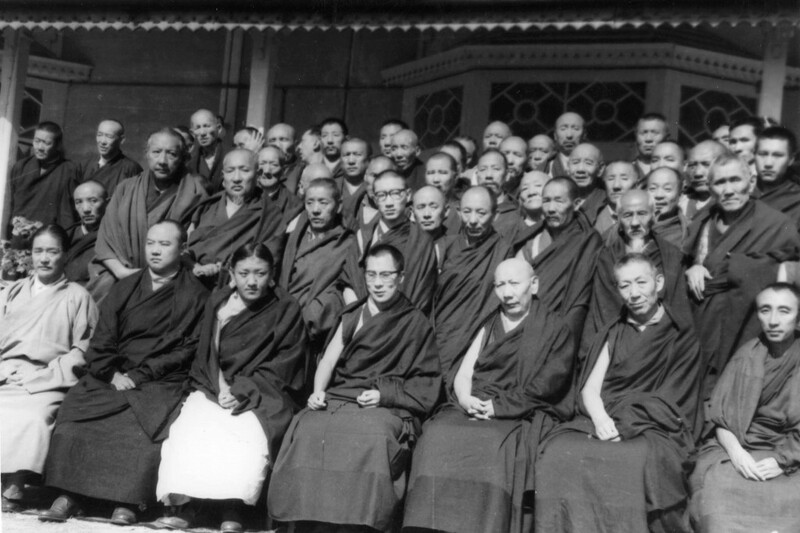 In 1924, Geshe Yonten of Gaden Shartse Monastery requested Kyabje Trijang Rinpoche to teach. 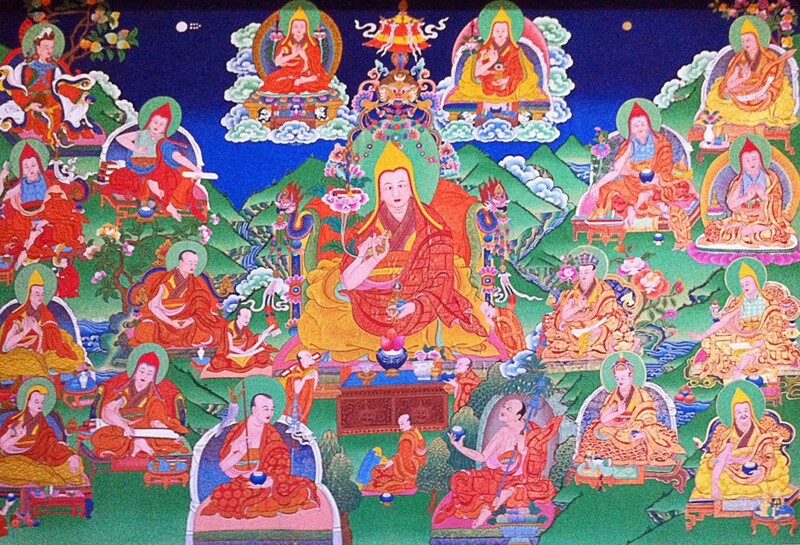 Kyabje Trijang Rinpoche was just 23 years old when he gave the oral transmission of the “Collected Works of Je Tsongkhapa and His Main Disciples” to about 200 monks, followed by the empowerment of Vajrayogini according to Naropa to about 60 incarnate Lamas and monks. 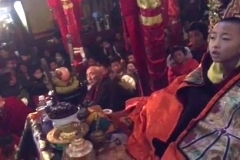 Then, at the request of Artog Tulku, Kyabje Trijang Rinpoche travelled to Sera Jey Monastery where he gave the empowerments of Five Deity Heruka and Hayagriva to about 200 people. 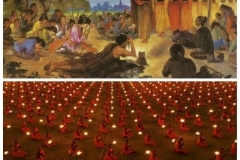 The following year when he was 24, Kyabje Trijang Rinpoche taught the Lamrim to 2,000 monks and lay people and also gave the Avalokiteshvara empowerment. 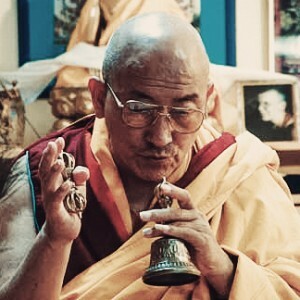 He further taught extensively on the practice of Guru Puja (Lama Chöpa). Thereafter up until the age of 27, Kyabje Trijang Rinpoche tirelessly travelled and taught extensively all over Tibet, primarily at Gelug monasteries but also at Sakya and Nyingma monasteries at their request. 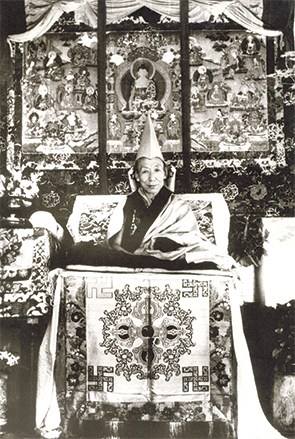 In 1928 at the age of 27, Kyabje Trijang Rinpoche returned to Chatreng and was invited by the Tantric practitioners of Chagra Gang to give initiations of the “Peaceful Form of Padmasambhava” and the “Six Forms of Padmasambhava According to the Old Concealed Texts”. He also encouraged and helped them to repair the Chagra temple. 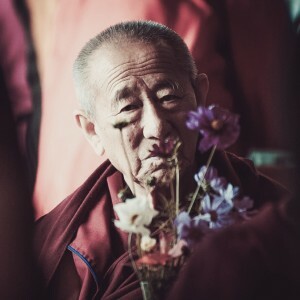 When he returned to Lhasa later that year, Kyabje Trijang Rinpoche made offerings of silver coins, grain and tea to all the monks of Gaden Monastery after audiences with His Holiness the 13th Dalai Lama and Kyabje Pabongka Rinpoche. He also set up a fund for the monks. 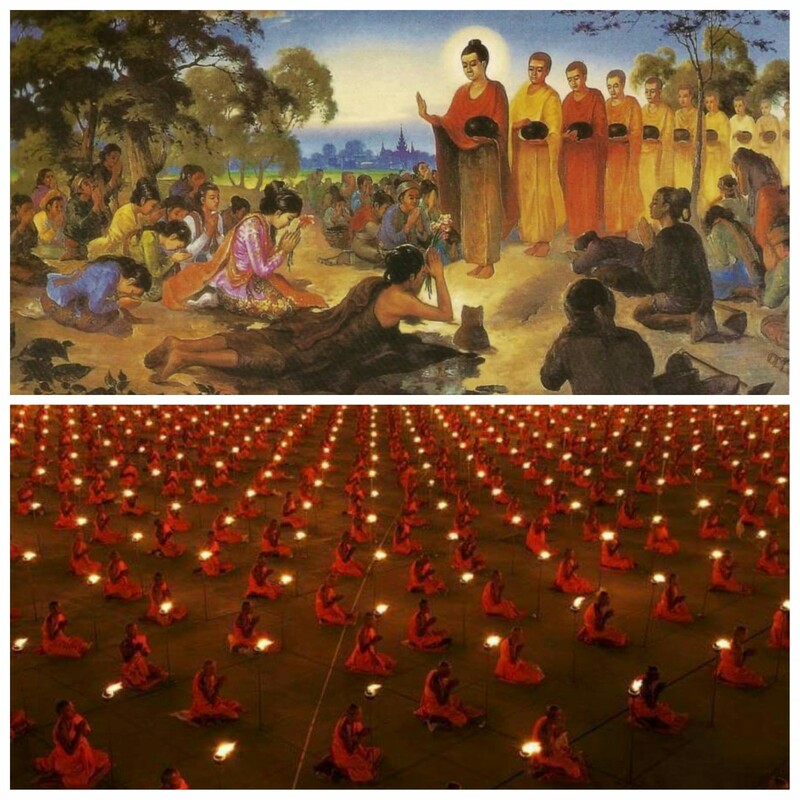 The following year, aged 28, he donated gifts to all who attended Monlam Chenmo, the Great Prayer Festival, and made many offerings to the Tantric colleges. Kyabje Trijang Rinpoche continued to visit monasteries to grant initiations and teachings, including the valleys and plains of Gyaltang. 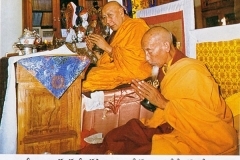 According to the author of Gangkar Rinpoche’s secret biography, Gangkar Rinpoche at this time had a vision of Trijang Rinpoche being the reincarnation of Padmasambhava, and he performed ceremonies in Trijang Rinpoche’s honour and presented him a large number of offerings, including a sacred Heruka statue. Kyabje Trijang Rinpoche also continued to receive many profound teachings from Kyabje Pabongka Rinpoche, including the oral instructions of many secret Gelugpa lineages until 1932. 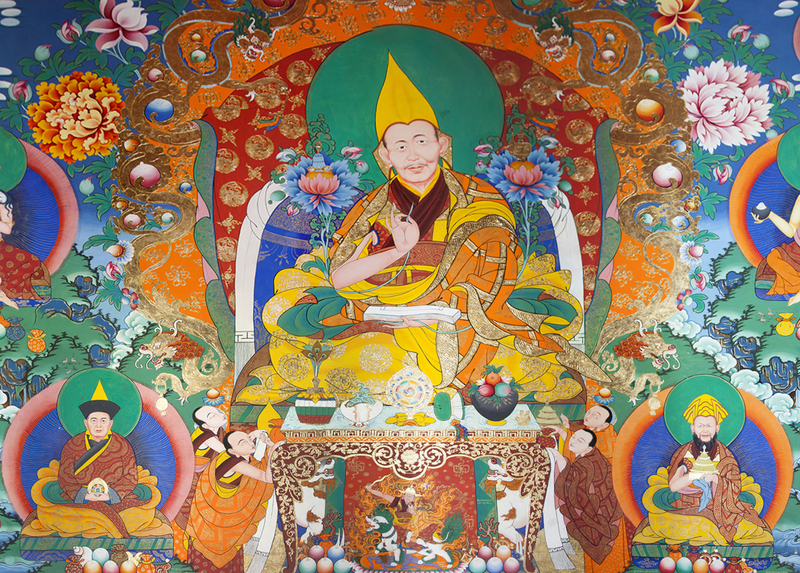 In 1933, following the death of His Holiness the 13th Dalai Lama, Kyabje Trijang Rinpoche played an active role in the funerary ceremonies and in building His Holiness’ mausoleum. In 1941, Kyabje Trijang Rinpoche was appointed as an assistant to His Holiness the 14th Dalai Lama by the Regent Taktra Rinpoche. 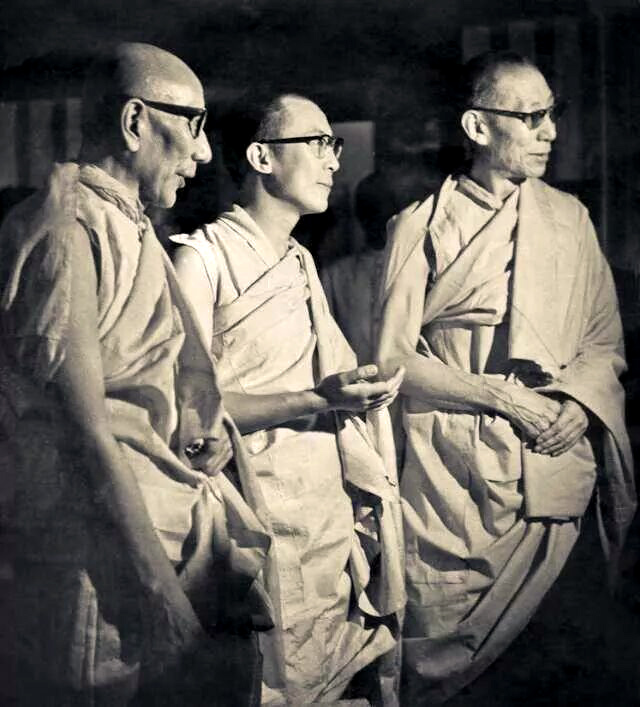 Subsequently in 1953, Kyabje Trijang Rinpoche was appointed as the junior tutor to His Holiness the 14th Dalai Lama. 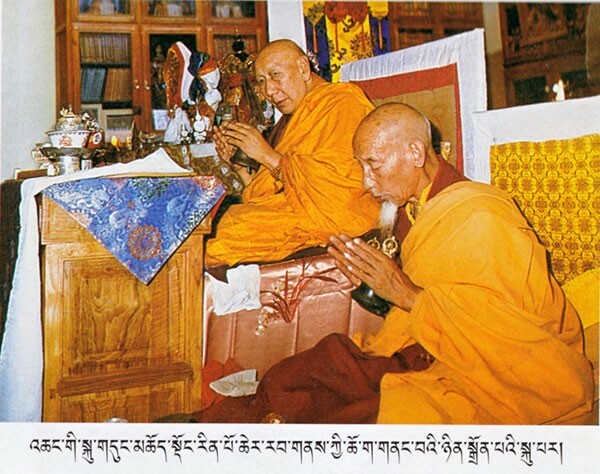 It was Kyabje Trijang Rinpoche who taught the 14th Dalai Lama to read and memorise prayers. 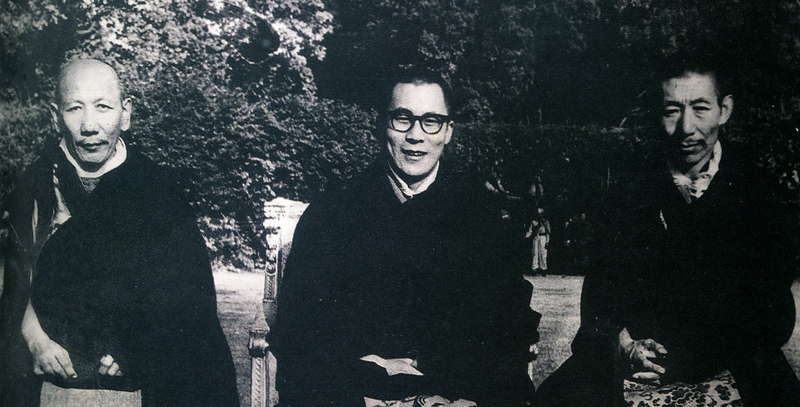 From that time on, Kyabje Trijang Rinpoche hardly left His Holiness the 14th Dalai Lama’s side and was a major part of the Dalai Lama’s busy life. As the years went by, Trijang Rinpoche was instrumental in passing on many teachings to the 14th Dalai Lama including the complete works of Je Tsongkhapa and his two heart sons Gyaltsab Je and Khedrup Je, as well as those of the glorious Panchen Lama Lobsang Chökyi Gyaltsen. After accompanying the Dalai Lama to China in 1954 and to India in 1956, Kyabje Trijang Rinpoche entered exile with His Holiness the 14th Dalai Lama in 1959 and settled in Dharamsala so as to remain at the Dalai Lama’s service at all times. Interestingly, the Tibetan National Anthem titled “Gyallu”, which was adopted by the community-in-exile around 1950 and which is still used to this day was composed by Kyabje Trijang Rinpoche with the radiance of Buddha Shakyamuni in mind. 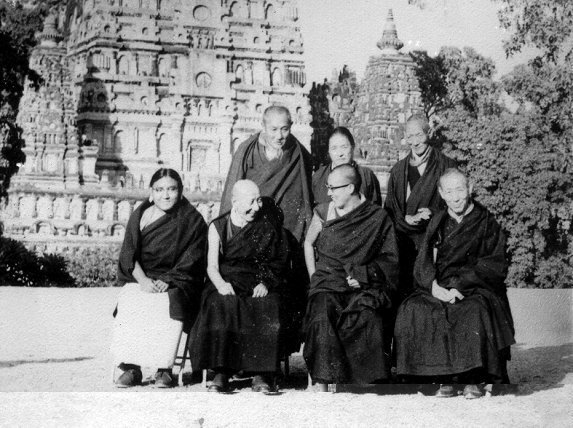 While in exile, Kyabje Trijang Rinpoche continued teaching and travelling throughout the Tibetan refugee communities such as Buxa, Dalhousie and later in the Karnataka settlements. When Gaden Monastery was re-established in Lama Camp No.1 in Mundgod, a residence, Trijang Labrang was established there for his use. Apart from teaching the assemblies of Gaden, Sera and Drepung, Trijang Rinpoche also regularly taught in Bodhgaya and Dharamsala. 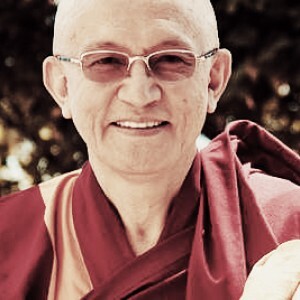 During the late 1960s and early 1970s, Kyabje Trijang Rinpoche would frequently be seen meeting with Kyabje Ling Rinpoche, the Dalai Lama’s senior tutor, in order to exchange teachings and empowerments. Kyabje Trijang Rinpoche taught Kyabje Ling Rinpoche the Lamrim Chenmo in 1969 and granted the Yamantaka empowerment the following year. In return, in 1970 Kyabje Trijang Rinpoche received from Kyabje Ling Rinpoche the “Action Tantra Empowerment of Vairochana” and also teachings on the Lamrim Chenmo. 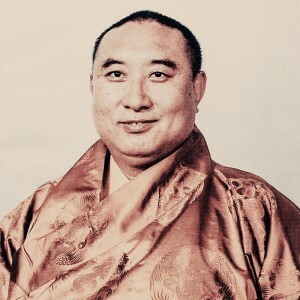 In 1972, Kyabje Trijang Rinpoche gave Kyabje Ling Rinpoche teachings on the Guru Puja and Yamantaka, and in return received a teaching on tormas (ritual offerings) to Yamantaka. At the behest of His Holiness the 14th Dalai Lama, Kyabje Trijang Rinpoche travelled widely internationally, teaching and giving empowerments in countries such as the United Kingdom, France, Germany and Switzerland, amongst others. In 1966, Kyabje Trijang Rinpoche performed the site blessing ritual for the Tibet-Institute in Rikon and in 1968, he consecrated the building together with Kyabje Ling Rinpoche. 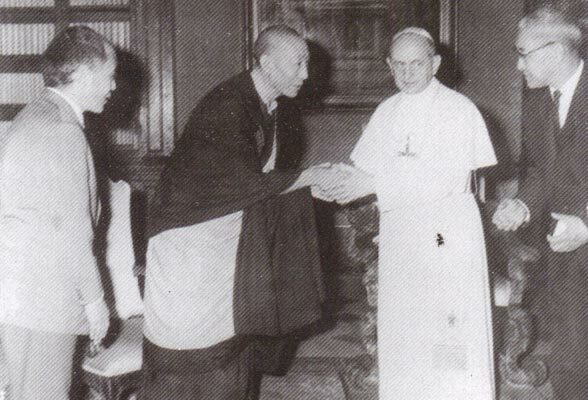 During this 1966 trip to Europe, a delegation which included Kyabje Trijang Rinpoche also met with Pope John Paul VI in the Vatican, following the instructions of the Dalai Lama. 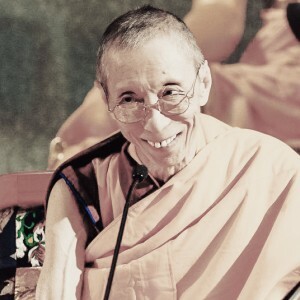 It would not be an exaggeration to say that the spread of Dharma in the West is directly and indirectly associated with Kyabje Trijang Rinpoche, through teachings of his own and of his many eminent disciples. The first generation of geshes and great Rinpoches of the Gelug tradition who have been responsible for spreading the Dharma in the West were Kyabje Trijang Rinpoche’s disciples. 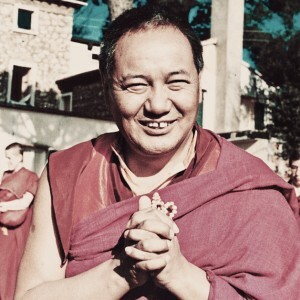 Some of his famous students and lineage holders include His Holiness the 14th Dalai Lama, His Holiness Zong Rinpoche, Lama Loden Sherab Dagyab, Dagpo Lama Jampa Gyatso, Denma Locho Rinpoche, Gelek Rinpoche, Geshe Rabten and Lama Yeshe, all of whom were catalysts for the growth of Dharma internationally. The greatness and significance of Kyabje Trijang Rinpoche’s contribution to the Dharma is unparalleled and hardly surprising considering that some of his past incarnations include great masters such as Prince Siddhartha Gautama’s charioteer, Chandra, who took the Prince on the expedition of The Four Sights (the old man, the sick man, the corpse and the ascetic) which revealed the truth of samsara to Prince Siddhartha and triggered his spiritual journey that eventually saw the rise of The Victorious One; the great Indian Pandit Atisha, who manifested at the critical time when Buddhism was in great decline and caused Buddhism to be established firmly in Tibet; and even Chandrakirti who received and recorded as well as transmitted all of Nagajurna’s teachings (which is the main source of teachings on Emptiness in most Tibetan monastic colleges today) in a number of important commentaries and works including the Pransangika Madhyamika. Kyabje Trijang Rinpoche, who was considered to be an emanation of Vajrayogini passed into clear light on 9 November 1981. 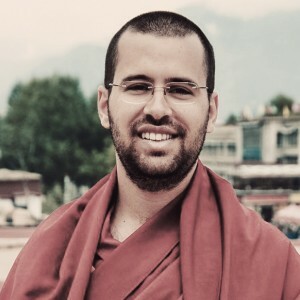 His current incarnation, Kyabje Trijang Chocktrul Rinpoche was born in 1982 and was officially recognised by His Holiness the 14th Dalai Lama on 23 April 1985. There is so much to the life of a great master. Where shall I start to pen my thoughts. Suffice to say that His Holiness Kyabje Trijang Rinpoche’s life is an inspiration for us to start our journey into spirituality. 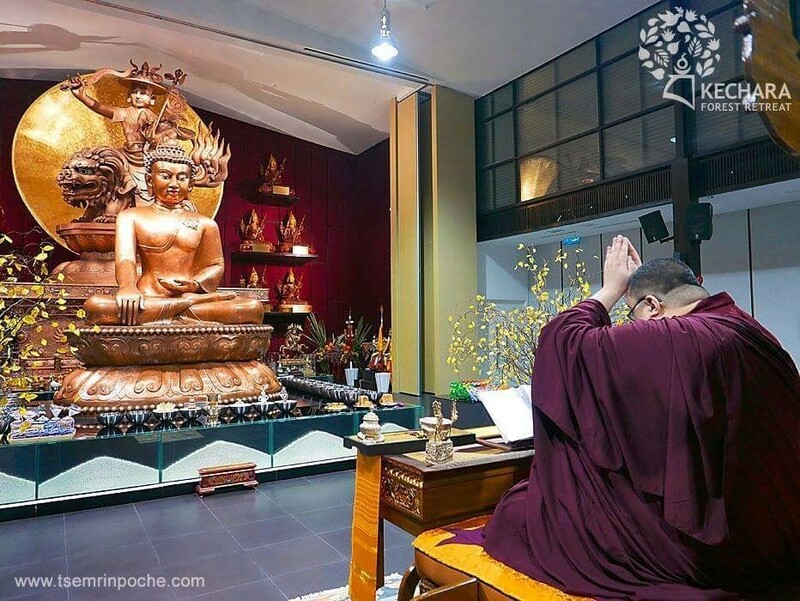 He touched so many lives in this modern times and is the teacher of so many masters again, that it seems almost all paths in Gelug tradition leads back to him – the grand sire of Tibetan Buddhism in the modern times. The Dalai Lama learnt many prayers and teachings of Je Tsongkhapa and his 2 heart sons from His Holiness Kyabje Trijang Rinpoche. 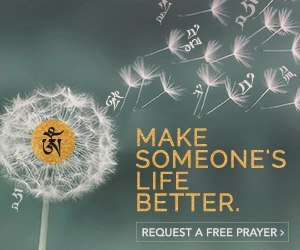 So, many teachings of the Dalai Lama is traced back to him. Thank you, admin for bringing the life of this great master to us. His Holiness Kyabje Trijang Rinpoche’s biography is very inspiring because Trijang Rinpoche devoted his life to the study and spreading the Dharma for the benefit of all sentient beings. 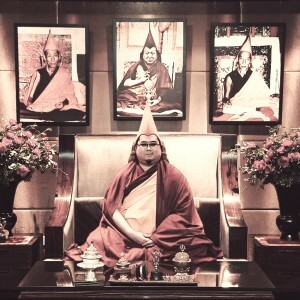 Due to his affinity in Dharma, Trijang Rinpoche has the fortune to meet his root teacher Kyabje Pabongka Rinpoche at a very young age and became his main disciples. 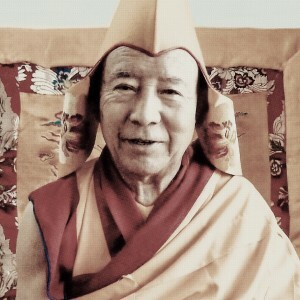 Trijang Rinpoche obtained his geese Lharampa degree in his early 20s and continued to teach and spread the Dharma. 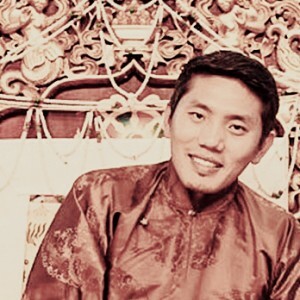 Because he was so qualified, Trijang Rinpoche was chosen as the junior tutor to the 14th Dalai Lama and gave the young spiritual leader the practice of protector Dorje Shugden. H.H. 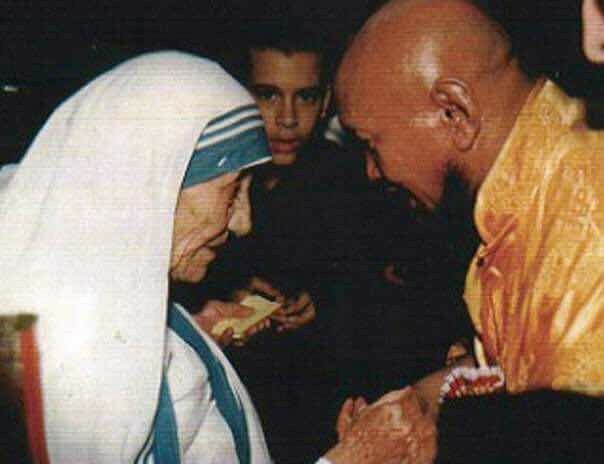 Trijang Rinpoche was definitely not in ordinary Buddhist teacher.